In an ongoing effort to improve employment opportunities for people with disabilities, the National Business & Disability Council (NBDC) at The Viscardi Center, along with Georgetown University, proudly presented The 3rd Georgetown University Conference on Employment of People with Disabilities on November 22, 2013. The U.S. Chamber of Commerce in Washington, D.C. hosted the Conference where experts examined both the deep challenges, as well as the great opportunities, for employment advancement of people with disabilities. 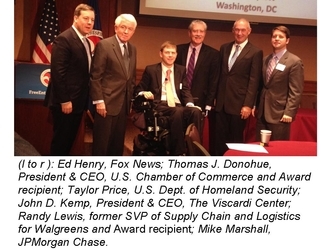 Fox News Chief White House Correspondent, Ed Henry served as Master of Ceremonies and introduced Georgetown University Alumni Mike Marshall of JPMorgan Chase and Taylor Price of the U.S. Department of Homeland Security. Each spoke of their commitment to increasing and implementing plans of action that will reduce the unemployment rate of people with disabilities. John D. Kemp welcomed Human Spirit Award recipient, Thomas J. Donohue, President & CEO of the U.S. Chamber of Commerce. During his acceptance speech, Mr. Donohue noted the Chamber’s commitment to the disability rights movement and spoke of the personal relationship he had with Dr. Henry Viscardi, founder of The Viscardi Center, and the vision they shared – to ensure people with disabilities are given the opportunity to be included and accepted in society and the workplace. Randy Lewis also received a Human Spirit Award. Mr. Lewis captured the audience attention with stories of his personal challenges and successes and its affect on his professional life. Known for his innovation, Mr. Lewis pioneered a disability employment model in Walgreen’s distribution centers which has been replicated at other national and international companies. He recently authored, No Greatness without Goodness, which is scheduled to release in April 2014. By the afternoon, attendees were engaged in discussions with experts in the areas of public policy, business, federal contracting, and technology as it examined the history and future of disability employment. Frances West, Director, IBM Human Ability & Accessibility Center, Katie Haritos Shea, Senior ICT Accessibility & Compliance Solutions Specialist and Debra Ruh, CEO and Founder of Ruh Global, led the Information and Communication Technology (ICT) panel. All experts in the field of ICT, each provided participants with a clear vision of what employers should be doing in areas related to ICT best practices and global standards, web site accessibility, and social media as it relates to the ADA, Section 503, Section 508, as well as the efforts that should be taken to meet the recent Office of Federal Contract Compliance Programs’ (OFCCP) 7% goal for federal contractors as it relates to the employment of people with disabilities. Andrew Imparato, Executive Director of the Association of University Centers on Disabilities, and Mike Eastman, the Equal Employment Advisory Council’s Senior Council for labor law policy, conducted the Disability Employment Policy and Law panel discussion and provided valuable information on the impact of the 2008 ADA Amendments Act and recent legal developments around disability employment. The Wounded Warriors and Work panel, moderated by Lisa Stern, included Ron Drach, President, Drach Consulting; Wounded Warrior Project, Andrew Godrich, USMC (Ret. ), National Park Service, Law Enforcement, Security & Emergency Services; Lori Golden of Ernst & Young, Veterans and AccessAbilities Efforts; Anthony K. Odierno, VP of Military and Veterans Affairs, JPMorgan Chase & Co.; and Jared Sheppard, US Army (Ret. ), President and CEO of Intelligent waves and Warriors Ethos. Each summarized the importance of their efforts in developing and implementing successful Employee Resource Groups, Veterans programs, and diversity initiatives which included discussions related to the accommodation process and workplace adjustments. Plans for the 2014 Conference will begin early next year. NBDC’s services are offered through tiered membership levels or on a consultant basis and assist businesses in developing strategies to implement, grow, measure and create solid disability programs. These include talent acquisition, advancement and retention strategies; customized training seminars and workshops; facility and IT accessibility surveys; and an information hotline for disability-related employment issues. Its initiatives to assist employers with expanding their recruiting of people with disabilities include a Job Postings Service that aids in attracting qualified people with disabilities to their companies, the NBDC National Resume Database® that provides access to resume listings 24/7 and the Emerging Leaders summer internship program for college students with disabilities. Founded by Dr. Henry Viscardi, Jr., who served as disability advisor to eight U.S. presidents and became one of the world’s leading advocates, The Viscardi Center provides Pre-K through High School education, school-to-work transition services, vocational training, career counseling and placement, assistive technology and workforce diversification assistance to children, adolescents, and adults with disabilities and businesses. A global leader, it employs more than 300 professionals, including experts in education, human resources and technology.